The following product-specific rules (the "Gaming Rules") govern the end user's (the "Player", "you" or "your") use of all the Operator's (or SBOBET Casino's) interactive casino products and services (the "Live Casino Games") available at www.sbobet.com (the "Website"). They form part of the Operator's General Terms and Conditions, which apply to all the interactive and wagering products and services the Operator offers to individuals who register for or are holders of a betting account with the Operator. To the extent there is any inconsistency between the Terms and Conditions and any of these Gaming Rules, the Terms and Conditions shall prevail. The Player shall have no cause of action and hereby waives any rights or claims against the software developer of the Live Casino Games for any matter, cause or thing involving the Player’s participation in the Live Casino Games or otherwise. The Player agrees that the Live Casino Games are for entertainment value only. The Player understands and acknowledges that no monetary bet is necessary or required to play the Live Casino Games. If the Player wishes to play without betting money, they may do so in the "demo play" area only. The Player's interest in the Casino and the Website is personal and not professional. A Player entering the Website does so solely for their own personal entertainment and any other entrance, access, use or re-use of the Live Casino Games is strictly prohibited. Unless otherwise specified, below (e.g. with certain live games) malfunctions of any sort (software or hardware) will void play. This means that any stake placed will be returned irrespective of any indicative result. SBOBET Casino reserves the right to reject SMART players or any suspected SMART players and Card Counters. Any activities using artificial intelligence called bots are strictly prohibited. Any attempt to breach or violate this policy will result in suspension and exclusion of the Player's Account. All winnings and commissions will be forfeited. If a Player wishes to make a complaint or dispute a Live Casino Game result, they must provide the Operator with their user ID the time of playing, the dealer's name, the Table ID and Round ID at the time of contacting the Operator. Failure to do so may result in the complaint being unable to be addressed by the Operator. Video images of Live Casino Games is kept for 24 hours and therefore Players must address their complaint within 24 hours of the dispute occurring. Any complaints submitted after 24 hours will be rejected by the Operator due to the absence of video evidence. In case of any dispute, the Player acknowledges and agrees that the Operator’s decision is final and official. There is no maximum gross win in any day. For Live Casino Games, valid results on the Live Casino Games are those results which are detected by the electronic sensor equipment installed for that purpose. If for any reason a result is not detected and registered by the electronic sensors, then that result is deemed to have not occurred, and any bets locked will remain locked until a valid result is determined. 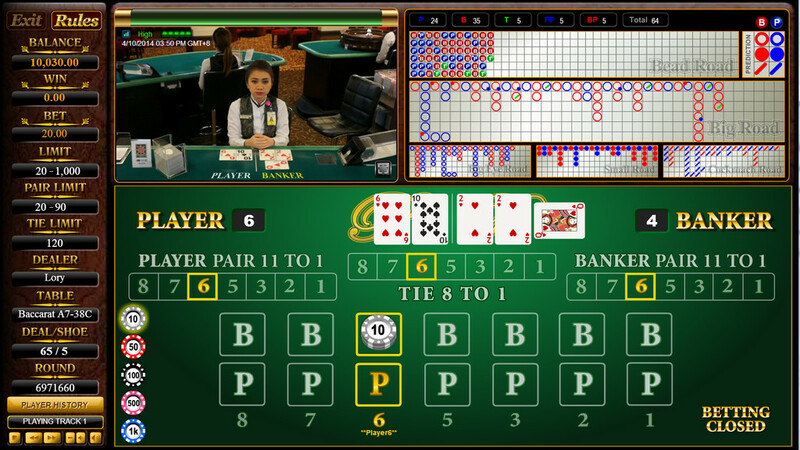 The objective of the game is to bet on whichever of two hands, the player’s hand or the banker’s hand, that the Player thinks will have a point value closest to 9. The Player can also bet on a tie. 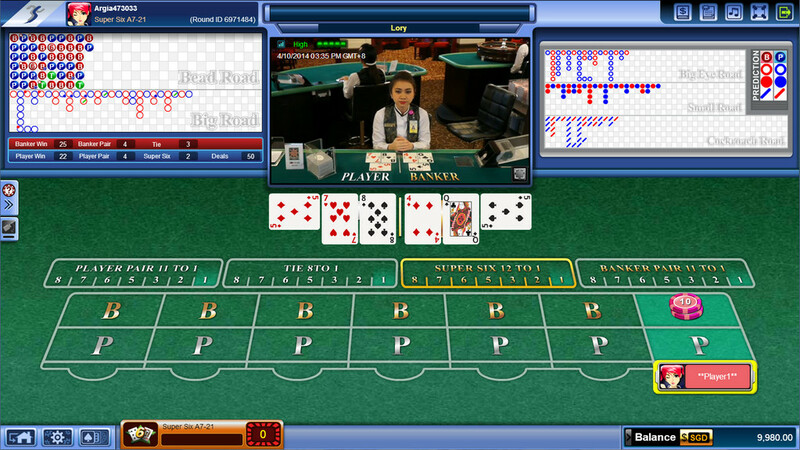 The game is presented to the Player with a live person dealing the cards on screen to provide the Player with a realistic gaming environment in real time. The theoretical return to player of this game is 98.41%. Over a long period of time, the game is likely to average a return to the Player of 98.48% of the total bets made. 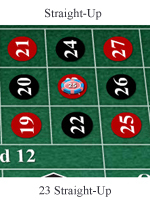 To place a bet, the Player moves the cursor to the pictures of the chips in the lower-right corner of the game window and left-click the chip value that they want to use. 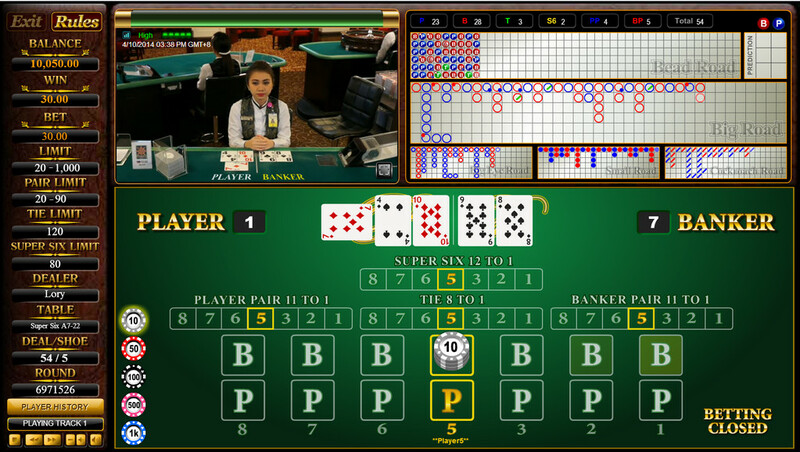 The Player then moves the cursor to the Betting Area on the table layout marked as players or bankers, tie or pair and / or super six, then left-clicks to place their bets. The chip will automatically appear in the betting box, with the total value of the bet written alongside. The bet amount will also appear at the bottom of the window. Each left-click will increase the bet value by one chip of the same value, up to the maximum bet for that table. If the Player wants to use a different chip value of this bet, they must move the cursor back to the pictures of the chips at the lower-right corner of the game window on the screen and left-click on the new chip value that they want to use. Then the Player must move the cursor back to the Betting Area on the table layout, and left-click again to increase the bet. Players must place their bets before the 30 second Betting Timer at the centre of the game window expires. Betting is not allowed once the Betting Timer has expired. DOUBLE bet button will enable player to double up all the unconfirmed bets which have been placed on the table. Any bet which has been placed and confirmed will not be doubled. All bets are confirmed and taken into the Player’s account once the CONFIRM BET button is left-clicked. Any bets placed after the CONFIRM BET button has been left-clicked but before the Betting Timer has expired must be followed by the CONFIRM BET button being left-clicked. If this is not done, then these additional bets will NOT be confirmed and NOT taken into the Player’s account. To remove all bets from the table layout, left-click the CLEAR BETS button. To remove the last bet from the table layout, left click the UNDO button. Note both CLEAR BETS and UNDO can only be done before the CONFIRM BET button has been left-clicked. If the CLEAR BETS is left-clicked, then these bets will NOT be confirmed and NOT taken into the Player’s account. The first card for the player’s hand. The first card for the banker’s hand. The second card for the player’s hand. The second card for the banker’s hand. If dictated by the drawing rules, the third card for the player’s hand. If dictated by the drawing rules, the third card for the banker’s hand. More than three cards can never be drawn for either hand. There are no values greater than nine in the game of baccarat. All card values are recalculated when the combined value of two or more cards is greater than nine. This new card value is determined by subtracting ten from the combined card value every time it reaches a number greater than nine. Below are a few examples of this equation. The hand with the highest point value wins. All losing bets will be collected and all winning bets paid. If a bet is a winner, the winnings will be posted to the credit balance and updated in the credits display upon selecting the next game or upon returning to the Lobby. If both hands have the same point value, that game is a tie and neither side wins or loses. In this case, tie bets win, but players and bankers bets do not win or lose so the bet is refunded back to the Player. Some common Baccarat terms are provided below, complete with explanations. Any bets on Player or Banker Dragon Bonus will pay differently according to the pay table. Fortune Six is one of the side bet in Live Baccarat. The bet will be paid if the Banker hand wins with a total of six. It pays 20 to 1 if the Banker hand wins with a total of six and it composed of three cards, and 12 to 1 if composed of two cards. Payouts are determined at standard odds that you will find to be identical to those used in all of the major Casinos of America, Europe and Asia. Winning players bets receive payout odds of 1 to 1 (even money). Winning bankers bets receive payout odds of 1 to 1 (even money). However, a commission equal to 5% of the win amount is deducted automatically. Winning tie bets receive payout odds of 8 for 1. If there is a tie, bets on the bankers or players are returned to the Player. Winning player pair / banker pair bets receive payout odds of 11 to 1. Player / banker first and second hand have to make a pair in order to win. Winning Player bets receive payout odds of 1 to 1 (even money). Winning Banker bets receive payout odds of 1 to 1 (even money) except in the event when the Banker wins on Six Points. Winning Banker bets with the Banker wins on Six Points receive payout odds of 1 to 2 (in such an event, only 50% of the amount placed on the Banker will be paid). Winning Player Pair / Banker Pair bets receive payout odds of 11 to 1. The Player / Banker first and second hand has to make a pair in order to win. Winning Super Six bets receive payout odds of 12 to 1. The Banker has to make a point count of six in order to win. The maximum and minimum bet limits will only be displayed within the Bet Limits menu in the gaming table after the Player has sit on the table. The terms players and bankers are the names given to two hands of cards that are dealt from the shoe during each round of play. The Player may bet on either the player’s hand or the banker’s hand. The Player may also bet on a tie. A natural hand is a two-card hand totalling eight or nine. The highest possible hand is a natural nine, which occurs when the first two cards drawn for either the bankers hand or the players hand total nine. The second highest hand is a natural eight. If a natural is drawn, this is an automatic winning hand and is called a natural winner. Neither of the hands will receive a third card when a natural is drawn. If both hands have the same value, a tie hand is the result. The first two cards of either the Player or the Banker hand form a pair (for example 8, 8 or K, K). A version of Baccarat where bets placed on the Banker shall receive payout odds of 1 to 1 except in the event when the Banker wins on Six Points (in such an event, only 50% of the amount bet on the Banker will be paid). A side bet placed on the Banker to win with a point count of six, with any other result being a loss. All cards except for Tens, Picture Cards, (Jacks, Queens and Kings) and Aces, are worth their face value. All Tens and “Picture Cards” are counted as zero. Aces are counted as one. There are no optional drawing rules in this game. Whether cards are drawn or not is determined according to the rules provided below. These rules are called the "Drawing Rules" or "Tableau", and are identical to those used in all of the major casinos of America, Europe and Asia. The decision to draw a third card for the players hand is made automatically according to standard casino rules as below. If the player's hand totals 0, 1, 2, 3, 4 or 5 a third card is automatically drawn for the players hand unless the banker's hand consists of a natural 8 or natural 9. If the player's hand totals 6 or 7 the decision is to stand. A card will then be drawn automatically for a banker's hand that totals 0, 1, 2, 3, 4 or 5. If a third card is drawn for the players hand, the decision to draw a third card for the bankers hand is made automatically according to standard casino rules as below. The dealer does not perform burn card between the games. The Operator reserves the rights to reshuffle the particular decks of cards if any human or non-human errors occur during cards shuffling. All bets are confirmed and taken into Players' account once the CONFIRM button is clicked. Live Baccarat pair bet game rules are almost the same as traditional baccarat, the difference is you can also bet on player pair / banker pair as well as player / banker wins. Player / banker first and second hand have to make a pair in order to win. Payout is 11 to 1. The Super Six bet option is only available on the Super Six (Non-Commission Baccarat) table. This is a side wager placed on the Banker to win with a point count of six, with any other result being a loss. Payout is 12 to 1. The card is scanned by the dealer and the result will be displayed on the Players' computer screen. If any card fails to scan, the dealer will re-scan the card in order to display the result to the Players. Any failure of the Players' equipment including but not limited to network connection or computer problems, will not void the game result. Players can check their own bet history on the Report section. Any Operator system malfunction and / or hardware failure during Live Baccarat will void the play and the particular table will be closed. In the event of two or more cards are dealt simultaneously by accident, the current round will be aborted, all bets will be returned and the particular shoe will be replaced with a new shoe. In the event of any cards being revealed during shuffling, the particular shoe will be replaced and dealer will shuffle new set of cards. In the event of any cards falling off the table, the current round will be aborted and the particular shoe will be replaced with a new shoe. If the dealer deals an extra card after the current game is finished, the current game result will be considered valid and the particular shoe will be replaced with a new shoe. In the event of a card being placed in the wrong position, the supervisor will correct the card position according to the computer screen (correct position). If a Player wishes to make a complaint or dispute a game result, they must provide SBOBET Casino, the date and time of playing, Table ID, dealer's name and Round number at the time of contacting SBOBET Casino. Failure to do so will result in the complaint being rejected by SBOBET Casino. Video image of card dealing is kept for 24 hours. Players must address their complaint regarding the dispute within 24 hour of the dispute occurring. Any complaints submitted after 24 hours will be rejected by SBOBET Casino without further explanation. Single zero roulette is played by spinning a ball on a round wheel with thirty seven numbered slots. The objective of the game is to predict where the ball will come to rest in the spinning wheel. There are 37 individually numbered sections in the wheel, labelled with the numbers 0-36. Bets can be placed on any one of these 37 numbers or on various groups of numbers displayed on the table. By predicting the right number, you earn a return on your bet. The size of the payoff depends on how the bet was placed. The theoretical return to player of this game is 97.38%. Over a long period of time, the game is likely to average a return to the Player of 97.34% of the total bets made. The Player’s chips are stacked by denomination at the bottom right of the game window. To place a bet, the Player must move the cursor to the pictures of the chips and left-click the chip value that they want to use. 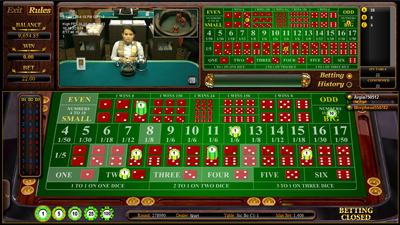 The Player must then move the cursor to the positions on the table layout that they want to place bets and left-click in each of those positions. The system will not let the Player place a chip unless it is a valid bet position. Chips will automatically appear underneath the cursor. The bet amount will also appear at the lower left of the window. Each left-click with the cursor in the same position will increase the bet by one chip of the same value, up to the maximum bet for that position. If the Player wants to change to a different chip value, they must move the cursor back to the pictures of the chips at the lower right corner of the game window on the screen and left-click on the new chip value that they want to use. Then move the cursor back to the table layout and left-click as before to place bets. To replace the same bets as made for the previous spin, left-click the RE-BET button. Players must place their bets before the 60 second Betting Timer at the right section of the screen expires. Betting is not allowed once the Betting Timer has expired. If the Player places bets that are lower than the minimum bet limitation and left-clicks the CONFIRM BET button, an alert window will appear to offer the Player two options: top up and confirm or return to game. By left-clicking the TOP UP & CONFIRM button, the PLAYER can top up every invalid bet to the corresponding minimum limitation and subsequently all bets are confirmed and taken into the Players’ account. By left-clicking the RETURN TO GAME button, the Player will return to the current bet options without any bets being confirmed. Depending on where the Player chooses to place their chips, they can bet on anywhere from one to eighteen numbers with a single bet. 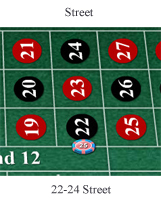 The table is laid out in a 12 x 3 grid that includes all of the 36 red and black numbers that appear on the wheel, together with 0 at the top of the layout. The Player can place chips in any of the betting positions as described below. A Straight-Up bet is a bet on one selected number winning. There are 37 possible Straight-Up bets. The bet is placed within the square of any specific number. If the ball comes to rest in that number in the wheel, this bet wins. If the ball comes to rest in any other number in the wheel, this bet loses. A Split bet is a bet on one of two selected numbers winning. There are 60 possible Split bets. The numbers must be adjacent on the table layout, and not on a diagonal. The bet is placed on a line that borders the square of any two adjacent numbers. If the ball comes to rest in either of the two numbers, this bet wins. If the ball comes to rest in any other number in the wheel, this bet loses. A Street bet is a bet on one of three selected numbers winning. There are 12 possible Street bets. The numbers must lie in a row across the table layout. The bet is placed on the line to the left of the row of numbers. If the ball comes to rest in any of these three numbers, this bet wins. If the ball comes to rest in any other number in the wheel, this bet loses. A Corner bet is a bet on one of four selected numbers winning. There are 22 possible Corner bets. The numbers must share one corner of the table layout. The bet is placed at the intersection of all four numbers. If the ball comes to rest in any of these four numbers, this bet wins. If the ball comes to rest in any other number in the wheel, this bet loses. A Zero Section bet is a bet on one of four particular numbers winning. There is only 1 Zero section bet. These numbers are 0, 1, 2, 3. The bet is placed at the left intersection of all four numbers. If the ball comes to rest in any of these four numbers, this bet wins. If the ball comes to rest in any other number in the wheel, this bet loses. A Zero Corner bet is a bet on one of three particular numbers winning. There are two Zero corner bets. These are 0, 1, 2, and 0, 2, 3. The bet is placed at the intersection of all three number. If the ball comes to rest in any of these three numbers, this bet wins. If the ball comes to rest in any other number in the wheel, this bet loses. A Six Line bet is a bet on one of six selected numbers winning. There are 11 possible Six Line bets. The numbers must lie in two adjacent rows across the table layout. The bet is placed on the line to the left and between the two rows of numbers. If the ball comes to rest in any of these six numbers, this bet wins. If the ball comes to rest in any other number in the wheel, this bet loses. A Column bet is a bet on one of twelve selected numbers winning. There are 3 possible Column bets. The numbers must all lie in one of the three columns down the table layout. The bet is placed in the box provided at the bottom of the layout. If the ball comes to rest in any of these twelve numbers, this bet wins. For any other number in the wheel, this bet loses. A Dozen bet is a bet on one of twelve selected numbers winning. There are 3 possible Dozen bets. The numbers must all lie in one of the three Dozens regions on the table layout. The bet is placed in the box provided to the left of the layout. If the ball comes to rest in any of these twelve numbers, this bet wins. For any other number in the wheel, this bet loses. Any number between 1 and 18, the 1 to 18 bet wins. Any even number, the even bet wins. Any red number, the red bet wins. Any black number, the black bet wins. Any odd number, the odd bet wins. Any number between 19 and 36, the 19 to 36 bet wins. In any other event, these bets lose. 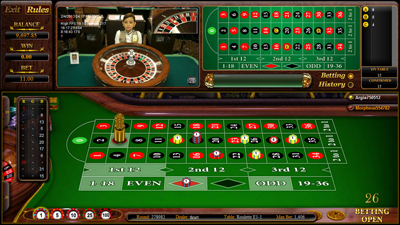 The player may bet on the selected area on the roulette wheel. There are 4 types of betting area. 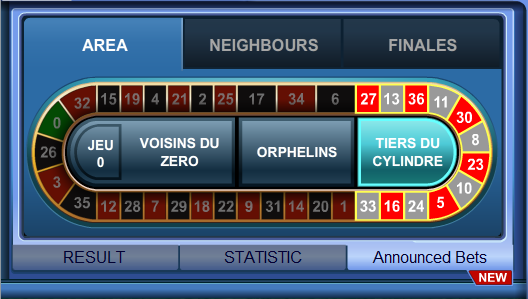 The player can place bets by clicking on one of the area on the Roulette racetrack shown on picture bellow. 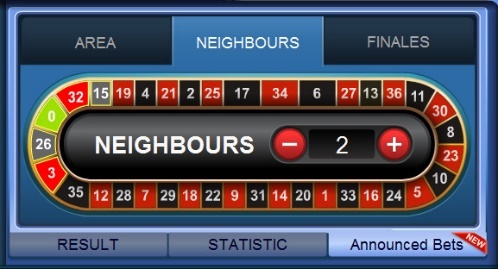 The Neighbours bets will enable player to place Straight-Up bets on a selected number and the numbers surrounding it. 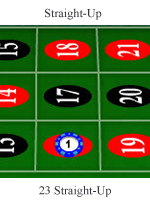 The player may choose up to 3 numbers to the left and right of the selected number and place the bets. The player places Straight-Up bets on 3 different numbers. 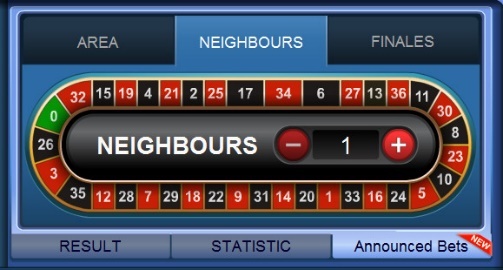 Example: The player selects 1 Neighbours bet on number 0. The betting numbers are 26, 0 and 32. The player places Straight-Up bets on 5 different numbers. 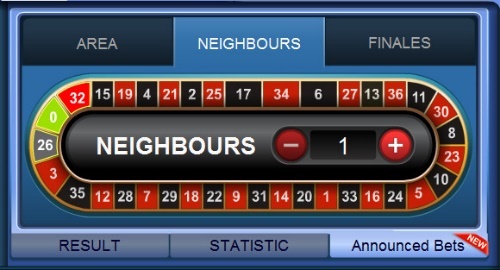 Example: The player selects 2 Neighbours bet on number 0. The betting numbers are 3, 26, 0, 32 and 15. The player places Straight-Up bets on 7 different numbers. 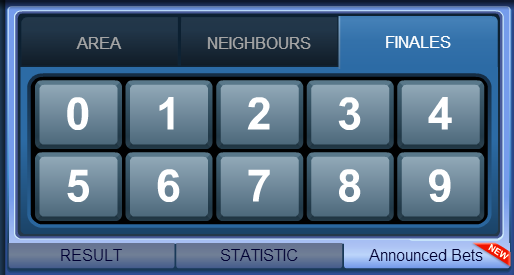 Example: The player selects 3 Neighbours bet on number 0. The betting numbers are 35, 3, 26, 0, 32, 15 and 19. Finales bets will enable player to place Straight-Up bets on multiple numbers ending with the same digit. Finale betting 0. The betting numbers are 0, 10, 20, and 30. Finale betting 1. The betting numbers are 1, 11, 21, and 31. Finale betting 8. The betting numbers are 8, 18, and 28. Once the Betting Timer has expired, the dealer will spin the ball in the wheel to commence play. The ball should at least spin for 10 circles before it falls into the pockets on the wheel. When the ball falls into one of the pockets on the wheel, it will be scanned by computer and the result will be displayed on the Player’s screen. The system will show the winning number and all winning bets will be highlighted on the table layout with a marker. Winning bets will have a marker chip placed on top of them. All losing bets will be collected and all winning bets paid. If a bet is a winner, the Player’s winnings will be posted to the Player’s credit balance and updated in the credits display upon selecting their next game or upon returning to the Lobby. 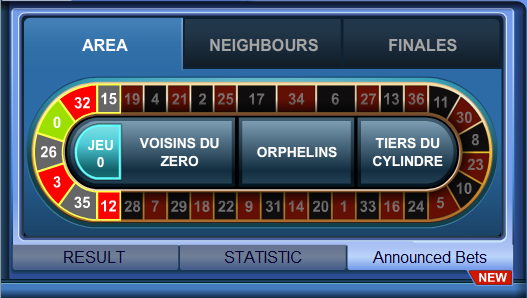 The history of the previous winning numbers is displayed in a window on the top left of the Player’s screen. There are three different coloured numbers in the history table. The Black coloured numbers mean that they belong to the Black set of numbers. The Red coloured numbers mean they belong to the Red set of numbers and the Green coloured number is for '0'. Where there is any malfunction of the electronic display in live roulette, the result will be settled according to the actual result determined by the roulette wheel. Any failure of the Player’s equipment including but not limited to network connection or computer problems will not void the game result. Players can check their own bet history in the Report section. Any SBOBET Casino system malfunction and / or hardware failure during live roulette will void the play and the particular table will be closed. SBOBET Casino reserves the right to declare a spin invalid where there is any error in the dealer’s spin or malfunction of the roulette wheel. Please note that in any live gaming environment mis-spins (e.g. where the ball does not drop into the wheel) are inevitable and where mis-spins occur the ball will be replaced and re-spun and the particular round resumed. The ball should spin for at least 10 revolutions before it falls into the pockets on the wheel. In the event of the ball falling into the pockets before it spins for at least 10 circles, the particular round will be aborted. In the event of the ball falling out from the wheel, the dealer will re-spin the ball and the particular round will be resumed. In the event of the dealer spinning the ball in the same direction as the wheel spinning direction, the particular round will be resumed. In the event of the ball falling outside the pockets on the wheel, the dealer will re-spin the ball and the particular round will be resumed. Players must provide SBOBET Casino, the time of playing, Table ID, dealer's name and round number when they wish to dispute a game result. Failure to do so will result in the complaint being rejected by SBOBET Casino. Video image of the ball and wheel spinning is kept for 24 hours. Players must address their complaint regarding the dispute within 24 hours after the dispute has occurred. Any complaints submitted after 24 hours will be rejected by SBOBET Casino without further explanation. The objective of the game is to successfully bet on the outcome of the three dice. Multiple bets can be placed on the table. The Player has the option of making anywhere from one to fifty bets at various odds. In Live Dealer Sic Bo, the Player is presented with a live person shaking the dice. Action and results are displayed in real time and in computer generated graphics for confidence and easy understanding. The theoretical return to player of this game is 96.21%. Over a long period of time, the game is likely to average a return to the Player of 96.06% of the total bets made. The Player has the option of making up to fifty two bets on the outcome of the roll of the three dice. 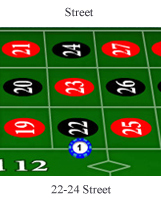 The outcome is based on the combinations that come up on the three dice and determined by the betting regions outlined in Table 1 below with the possible bets that the Player can make outlined in Table 2. The Player’s chips are stacked by denomination at the bottom right of the game window. To place a bet, the Player must move the cursor to the pictures of the chips and left-click the chip value that they want to use. 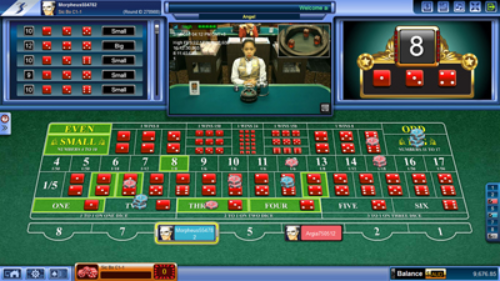 The Player must then move the cursor to the positions on the table layout that they want to place bets and left-click in each of those positions. The system will not let the Player place a chip unless it is a valid bet position. Chips will automatically appear underneath the cursor. The bet amount will also appear at the bottom left of the window. Each left-click with the cursor in the same position will increase the bet by one chip of the same value, up to the maximum bet for that position. DOUBLE bet button will enable player to double up all the unconfirmed bets which have been place on the table. Any bet which has been placed and confirmed will not be doubled. Table 1 below illustrates the Betting Regions referred to in Table 2. The letters denote the various Betting Regions. The various bets available within these Betting Regions are explained in Bet Descriptions. Single Number The number on 1 dice will match the number bet. The number on 2 of the dice will match the number bet. The number on all 3 of the dice will match the number bet. Two Dice Combo The numbers on 2 of the 3 dice will equal the numbers bet. 3 Dice Totalling 4 or 17 The sum of the numbers on all 3 dice will equal 4 or 17. 3 Dice Totalling 5 or 16 The sum of the numbers on all 3 dice will equal 5 or 16. 3 Dice Totalling 6 or 15 The sum of the numbers on all 3 dice will equal 6 or 15. 3 Dice Totalling 7 or 14 The sum of the numbers on all 3 dice will equal 7 or 14. 3 Dice Totalling 8 or 13 The sum of the numbers on all 3 dice will equal 8 or 13. 3 Dice Totalling 9 or 12 The sum of the numbers on all 3 dice will equal 9 or 12. 3 Dice Totalling 10 or 11 The sum of the numbers on all 3 dice will equal 10 or 11. Any Double The number on 2 of the 3 dice will be the same. Any Triple The number on all 3 dice will be the same. Specific Triple The number on all 3 dice will equal the number bet. Small The sum of the numbers on all 3 dice will equal 4 through 10 (Triples lose). Even The sum of the numbers on all 3 dice will be an even number with the exception of triples (Triples lose). Big The sum of the numbers on all 3 dice will equal 11 through 17 (Triples lose). Odd The sum of the numbers on all 3 dice will be an odd number with the exception of triples (Triples lose). Where there is any malfunction of the electronic display in Live Dealer Sic Bo, the result will be settled according to the actual result determined by the dice. Any Operator system malfunction and / or hardware failure during Live Dealer Sic Bo will void the play and the particular table will be closed. The Operator reserves the rights to re-roll or re-shake the dice or declare a roll or shake invalid if any human or non-human errors occur during rolling or shaking process. The objective of the game is to make the total point value of the Player’s hand of cards exceed the total point value of the House hand of cards, without exceeding 21. Whoever has the best hand wins the game. Multiple players may place bets on the same seat. 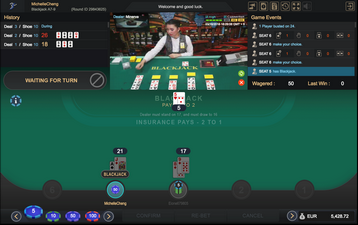 Each player on the same seat may choose different actions and it will be reflected by the cards being displayed on their user interface table. The physical table may shows more cards for a particular seat since there are multiple players playing on the same seat with different actions. Player should always refer to his user interface table for his own cards. The theoretical return to player of this game is 96.57%. Over a long period of time, the game is likely to average a return to the Player of 96.11% of the total bets made. 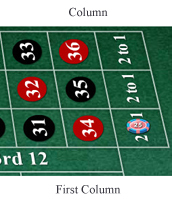 To place a bet, the Player moves the cursor to the pictures of the chips in the lower-left corner of the game window and left-click the chip value that they want to use. The chip will automatically appear in the betting circle, with the total value of the bet written alongside. The bet amount will also appear at the top of the window. The Player may also click on the chip to place a bet on the Insurance when it becomes available. The left-click on the chip will cause the chip to automatically appear in the area marked INSURANCE PAYS - 2 TO 1. Each left-click will increase the bet value by one chip of the same value, up to the maximum bet for that table. 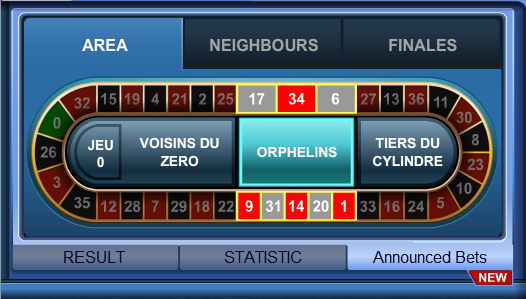 If the Player wants to use a different chip value of this bet, they must move the cursor back to the pictures of the chips at the lower-left corner of the game window on the screen and left-click on the new chip value that they want to use to automatically place the chip in the betting circle. Players must place their bets before the 30 second Betting Timer at the bottom-left corner of the game window expires. Betting is not allowed once the Betting Timer has expired. All bets are confirmed and taken into the Player’s account once the CONFIRM button is left-clicked and accepted by the system by displaying ‘Bet Has Been Confirmed’ message. Any bets placed after the CONFIRM button has been left-clicked but before the Betting Timer has expired must be followed by the CONFIRM ADD button being left-clicked. If this is not done, then these additional bets will NOT be confirmed and NOT taken into the Player’s account. To place the same bet as made for the previous round, left click the REPEAT button. To remove all bets from the table layout, left-click the CANCEL button. Note this can only be done before the CONFIRM or the CONFIRM ADD button has been left-clicked. If the CANCEL is left-clicked, then these bets will NOT be confirmed and NOT taken into the Player’s account. The first card for all of the players’ hand. The first card for the dealer’s hand. The second card for all of the players’ hand. In the event of the dealer’s first card is an Ace hand, players will be offered to participate in Insurance Betting. Players must place their Insurance bets before the 10 second Betting Timer at the bottom-left corner of the game window expires. Betting is not allowed once the Betting Timer has expired. At the Players’ discretion, the third and any additional cards can be drawn by the dealer to their hand(s). When acting on their hand(s), the Players may request or decline additional cards by use of the mouse. Players may Left-click on the HIT button to draw another card or the STAND button to retain the current hand. Players must make their decision before the 8 second Decision Timer at the bottom-left corner of the game window expires or will be automatically ‘Stand’ once the timer has expired. In the events of all players’ hand are busted or surrendered, dealers does not deal additional cards to dealer’s hand. Player’s hand is only allowed to SPLIT once. Payouts are determined at standard odds that are identical to those used in all of the major Casinos of America, Europe and Asia. Winning BLACKJACKS receive payout odds of 3 to 2 (1.5 to 1). Winning INSURANCE bets receive payout odds of 2 to 1. All other winning hands receive payout odds of 1 to 1 (EVEN MONEY). The maximum and minimum bet limits will only be displayed within the Gaming Rules Menu of this Game after the Player has logged in. In the game of Blackjack there are Drawing Rules that apply to the Dealer’s hand, as provided below in Table 1. The dealer must draw with any hand totalling 16 or less, and must stand with any hand totalling 17 (including soft 17) or more. There are no Drawing Rules for the Player’s hand. The Player may take as few, or as many, cards as they desire (unless the Dealer has Blackjack or the Player has gone Bust). All cards numbered 2 through 10 are worth their face value. All “Picture Cards” (Jacks, Queens and Kings) are worth 10 points. All Aces are worth 1 or 11, depending on which value would produce the highest total without exceeding 21. Players are advised to observe the difference between cards numbered 6 and 9. As well as being the name of the game, Blackjack is also the best hand. It consists of any ace and any ten-valued card in the initial two-card hand. When a Blackjack appears, whether for the Player or for the House, no other cards are drawn. Blackjack is an automatic winner, except against another Blackjack, in this case the hand is a Push (also called a Tie or Stand-Off). Even Money will be offered to the Player who has Blackjack. Even Money offers the Player to claim the winning with 1 to 1 payout regardless of the House hand’s result. If drawing additional cards by either the Player or the House results in a card total exceeding 21, that hand has “too many” and is considered to have Bust. A Bust Player hand loses automatically. When this occurs, the House will not draw a third or any additional cards for the House hand, and that hand is finished. On any two-card hand, the Player may choose to double their bet. This allows the Player the opportunity to win double. The DOUBLE button in the game window will illuminate to advise the Player that this option is available. If the Player decides to Double, they can now left-click on this DOUBLE and an additional bet will be placed alongside the initial bet, which is fixed at a value equal to the initial bet. One card will be dealt automatically to the Player’s hand. The Player will not be allowed to draw more than one additional card. If the Player decides not to Double, the game will continue as normal. The Player has to decide whether to Hit, meaning to draw an additional card(s) or to stand, meaning to retain the current hand. The Player may Hit or Stand by left-clicking on the HIT or STAND buttons provided in the game window. The House has to Hit or Stand according to the Drawing Rules. If the exposed House card is an Ace, the Player will be offered the opportunity to buy Insurance. The INSURANCE layout in the game window will illuminate to advise the Player that this bet is available. 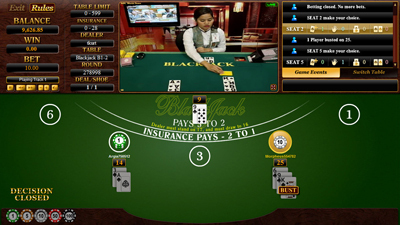 The Player may now left-click on the chip to place an Insurance bet. If the Player decides to place Insurance Bet and the House does have Blackjack, the Player will receive payout odds of 2-1 for the insurance bet, and the Insurance bet will be returned to the Player. The Player will of course lose the initial bet. So the net effect is that the Player breaks even. If the House does not have Blackjack, the Player loses the Insurance bet and the game then continues as usual. If the Player feels that the initial two-card hand is not strong enough to beat the House hand, the Player may choose to Surrender. This action will finish the hand at that point, with a loss of half of the initial bet. The SURRENDER button in the game window will illuminate to advise the Player that this option is available. The Player can now left-click on this button and half the original bet will be returned. If the Player's first two cards are of the same card rank, they are called a pair. This allows the Player the opportunity to play two hands and win twice. The SPLIT button in the game window will illuminate to advise the Player that this option is available. The Player may now left-click on this button and an additional bet will be placed alongside the initial bet, which is fixed at a value equal to the initial bet. If the Player’s decides to Split the pair, one card will be dealt automatically to the first of the two Split hands. The Player will then have the option to draw additional cards until that hand is completed, using the HIT, DOUBLE or STAND buttons. An exception for splitting Aces, only one more card will be drawn for each split hand. If the Player decides not to Split the pair, the game continues as normal. This is the next best hand after a Blackjack. It consists of three or more cards totalling 21. The dealer performs burn card at the beginning of a new shoe. The dealer does not perform burn card between the games. Any Operator system malfunction and / or hardware failure during Live Blackjack will void the play and the particular table will be closed. All bets will be returned irrespective of the result. In the event of a card being placed in the wrong position, the game will be paused and the supervisor will correct the card position according to the computer screen (correct position). Any cards being dealt before the ‘Decision has been confirmed’ notification or during ‘Please wait for other player’s decision’ notification is displayed will be burned. In the event of any cards falling off the table, the game will be abandoned except for player with ‘BUST’, ‘SURRENDER’, ‘EVEN MONEY’ and ‘BLACKJACK’ hand. The extra card will be burned regardless of the card result. If the extra card is dealt after the current game is finished, the current game result will be considered valid and the extra card will be burned and the game will be resumed. The cards will be burned and the scan result of those particular cards will be erased and the game will be resumed. In the event of the incorrect scan result of those particular dealer’s cards could not be erased and rescanned, the game will be abandoned except for players with ‘BUST’, ‘SURRENDER’, ‘EVEN MONEY’ and ‘BLACKJACK’ hand. Players with BLACKJACK hand will be considered as valid result. Players with BUST hand will be considered as valid result. Players with non BUST hand (consists of 2 more cards) will be considered win. Players with incomplete hand (only 1 card or no card), the bets will be refunded. All Insurance Bet regardless of the result will be refunded. Players who choose to SURRENDER and EVEN MONEY will be considered as valid result. In the event of a game being voided, all bets will be returned irrespective of the bet position and result. The Operator reserves the rights to reject SMART players or any suspected SMART players and Card Counters. The objective of the game is to bet on whichever of the two hands, the Dragon’s hand or the Tiger’s hand that the Player thinks will have the highest card value. The Player can also bet on Tie. Dealer will draw one card for the Dragon’s hand and one card for the Tiger’s hand. No additional cards will be drawn for each hand. Over a long period of time, the game is likely to average a return to the Player of 96.265% of the total bets made. 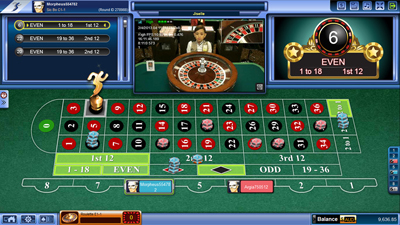 To place a bet, the Player must swipe and select which chips he wants to use. Tap the chip value and choose the available betting options such as Dragon’s hand, Tiger’s hand or Tie result. The chip will automatically appear in the betting option. Tapping the same chip value will increase the Player’s bet by the selected chip, or the Player can also select another amount of the chips. The Player can increase the bet amount until reaching the table’s maximum betting limit. To remove the last chip of the Player’s bet, tap the UNDO button in the Game user interface. The Player must place their bets before the 20-second Betting Timer at the top of the game window expires. Betting is not allowed once the Betting Timer has expired. DOUBLE bet button will enable the Player to double up all the unconfirmed bets which have been placed on the table. Any bet which has been placed and confirmed will not be doubled. All bets are confirmed and taken into the Player’s account once the CONFIRM button is tapped. Any additional bets placed after the CONFIRM button has been tapped before Betting Timer has expired must be followed by the CONFIRM button. If this is not done, then these additional bets will NOT be confirmed and NOT taken into the Player’s account. To remove all the bets placed in all betting options, tap the CLEAR button from the Gaming Control. Note both CLEAR and UNDO can only be done before the CONFIRM button has been tapped. The Player will not be able to place bet on both Dragon’s hand and Tiger’s hand. The Player can view the bet amount and the win amount at the top-left corner of the window. If the Player places bets that are lower than the minimum bet limitation and taps the CONFIRM button, an alert window will appear to offer the Player two options: top up or cancel to return to the game. By tapping the TOP UP button, the Player can top up every invalid bet to the corresponding minimum limitation, and subsequently, all bets are confirmed and taken into the Players’ account. By tapping the CANCEL button, the Player will return to the current bet options without any bets being confirmed. As soon as the Betting Timer has expired, the dealer will burn one card, and then deal one card for the Dragon’s hand and then one card for the Tiger’s hand. The hand with the highest card value wins the game. An Ace is the lowest card value and a King is the highest card value. The hand rank of the cards goes from Ace-2-3-4-5-6-7-8-9-10-J-Q-K. And in the event when both of the cards drawn are of the same value, or a Tie, only half of the bet amount placed will be paid. During Tie game, if the Player bets on either Dragon’s hand or Tiger’s hand, only half of the Player’s bet will be returned. 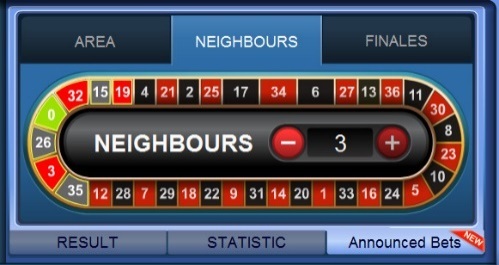 After the first round, the Player can click the REBET button to place the same bet from the previous round. 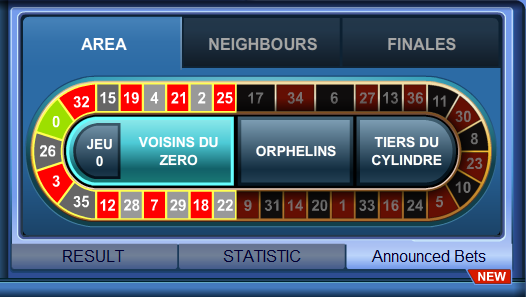 After the first round, the Player can click the REBET button to place the same bet from the previous round. Live Dragon Tiger game also has side bets: Odd/Even, Big/Small, Black/Red. The side bets are the minor bets that can be placed by the Player. NOTE: When betting on the side bets, the Player loses all his/her bets on the side bets he/she placed if the card is dealt as 7. Over the 50th round of each time, it is not acceptable to bet with side bet. Cards in Live Dragon Tiger are ranked from the lowest to the highest starting from Ace to King. The dealer will burn one card in the beginning of every round in the games. The card is scanned by the dealer, and the result will be displayed on the Player’s screen. If any card fails to scan, the dealer will re-scan the card to display the result to the Player. Any failure of the Player’s equipment including but not limited to network connection or computer problems, will not void the game result. The Player can check their bet history on the Report section. Any Operator system malfunction and/or hardware failure during Live Dealer Dragon Tiger will void the play, and the particular table will be closed. In the event of two or more cards are dealt simultaneously by accident, the current round will be aborted, all bets will be returned, and the particular shoe will be replaced with a new shoe. In the event of any cards falling off the table, the current round will be aborted, and the particular shoe will be replaced with a new shoe. 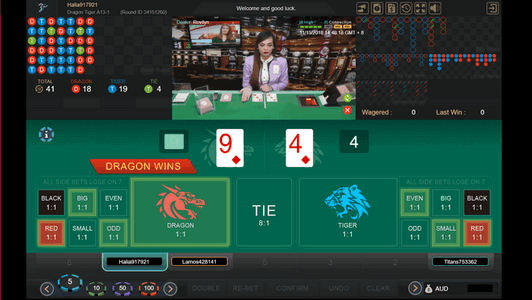 If the dealer forgets to burn a card in the beginning of the round and place it on either Dragon’s or Tiger’s hand, the supervisor will fix the card position according to the computer screen (correct position) and the game will be resumed. If a Player wishes to make a complaint or dispute a game result, they must provide SBOBET Casino with the date and time of playing, Table ID, dealer's name and Round number at the time of contacting SBOBET Casino. Failure to do so will result in the complaint being rejected by SBOBET Casino. Video image of card dealing is kept for 24 hours. Players must address their complaint regarding the dispute within 24 hour of the dispute occurring. Any complaints submitted after 24 hours will be rejected by SBOBET Casino without further explanation. The Operator reserves the right to change any of these rules at any time in accordance with the Terms & Conditions.